I have personally lived as a “split-rail” Christian for most of my adult life. I was open about my faith when asked and “tried” to live according to God’s word each day. But in reality, I had separated God from my life. I went about my day-to-day business using God when I needed Him and leaving Him out when not convenient. This dichotomy of existence caused internal issues within me that rose to the surface as both the inability to control my temper, frustration and bitterness. First let’s address the concerns I had about becoming a man of God. These thoughts keep me at bay for years and hindsight they are weak but at the time they were mountains. My first thought was that it was going to be quite embarrassing to tell my wife that I hadn’t been the man of God I was supposed to be. This was a HUGE stumbling block for me — even though we had established a good relationship. My pride was strong. And if I showed weakness, I wouldn’t be a man’s man. In full disclosure, I struggled for many years with turning full control of my life over to God. Now that didn’t mean that I was consciously rebelling. In fact, I truly wanted to be a man of God. But the thought of getting there was just too much! I didn’t know how to get from A to B. I didn’t have the steps to make the whole process seem less overwhelming. I had convinced myself that the life I had was exactly the life I wanted! So why change? The problem lied in the fact that my life had become devoid of patience and filled with bitterness, anxiety, a short temper, stress, and all of the other wonderful adjectives related to life without God. First, turn everything over to God. Stop trying to be in control of everything. You’re not. And once you admit that and become OK with that, then you’ll start to notice a turn in your life. When stress, anxiety, and hardships come, I now turn them over unequivocally to God. I know that He has a bigger and better plan for my life—a plan that I can’t even imagine! And sometimes it doesn’t always work the first time and persistence may be required of me. I may have to turn the same issue over to Him numerous times throughout a given day, and that’s OK.
Third, putting God and my wife in front of me has proven to be the only way to live. This order of importance has provided me with more bounty than I could have ever imaged. I know that it goes against human nature to put someone else ahead of you. But I promise that if you do, the results will shock you! Your reward will be tenfold. So, in essence, what is a man of God? 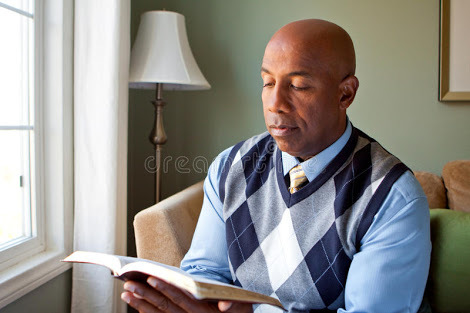 He is a man who has decided to let God control his life by applying God’s word to his everyday activities, by obeying God’s lawful commands in all of his doings, and by serving God and showing the love of Christ to others through both words and actions. It’s the only way. And it’s so easy to discover.